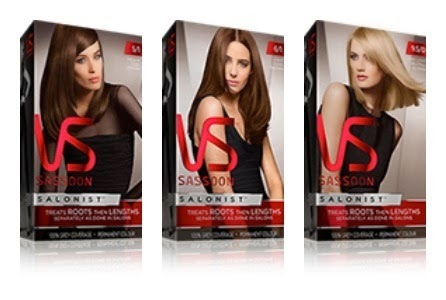 Vidal Sassoon Salonist Hair Tips From The Experts! 1. What is your best tip to achieve that "fresh from the salon" look even weeks after using DIY at home hair colouring kits? I tell my clients to wait at least 48 hours to wash after coloring hair, this allows the hair color to completely penetrate the hair shaft. In terms of maintaining your colour, water is the biggest factor in color fade, due the oxidative minerals in wash water that can cause free radicals and affect hair quality. Make sure you use a shampoo and conditioner designed to protect colored hair. Sun protection is also a big factor so don’t forget to protect your hair, VS Leave In Conditioner is a great way to do this. Heated styling can also play a part so try using a lower temperature when styling, and always use a heat protector product. 2. Is it ok to change at home dye brands each time you dye your hair or is it safer to stick to one brand? Why? No two formulas for hair color are the same but Vidal Sassoon Salonist™ has been designed specifically to meet the needs of women who want to color their hair in the comfort of their own home, making the salon experience more accessible. 3. What's the difference between at-home dye and the kind salons use (other than the stylist’s expertise of course!!)? In salons, colorists know that an essential component of great hair color is to treat roots and lengths separately because new hair growth and previously colored hair absorb color at different rates. Vidal Sassoon is now giving women the tools and techniques to do this at home in order to master the art of rich color with full depth and tone. Inspired by the original salon genius Vidal Sassoon, Vidal Sassoon Salonist™ innovative 2-step technique means the home hair color system treats roots and lengths of the hair separately as done in salons. 4. What is the best way to lighten your hair color after going a darker shade without resorting to bleaching? Whether you are dyeing your hair darker or lighter, you should only lift two levels lighter or go down two levels darker. If you’re going lighter, a cool or ashy tone will counteract brassiness, which is an unwanted side effect of the lightening process. Since you are adding pigment when you go darker, hair can appear thicker and glossier. Lightening hair can have a similar effect but is caused by the texture of the hair shaft changing rather than the cuticle filling up. 5. What is your best tip for keeping your hair color vivid and full of life between dyes? Develop a Personal Care routine, each of us are different and treat our hair accordingly. Find a routine that works for you and stick to it. I think the best rule for maximizing the life of your Color is moderation - don't over-wash, over-style or over-stress your hair. Look after it and it will repay you. 6. What shade do you think is the "go-to" color for the spring/summer season? What's popular and what's not? I think after this e-mail interview and having used Vidal Sassoon at-home products before, I will definitely go with the new Vidal Sassoon Salonist. I think the hardest part will be deciding which shade to go for this time! For more information about Vidal Sassoon Salonist please visit the official Vidal Sassoon website! I want you to enjoy new Vidal Sassoon Salonist too and P&G was lovely enough to offer me up some full product coupons to give away to TWO (2) lucky AME readers! Enter using the ballot below! Open to Canadians 18+ excluding Quebec. Mandatory entry must be done for extras to count. Winner will be drawn at random using GiveawayTools on April 29th, 2015. Valid email address and skill testing question to qualify. Winners have 48 hours to claim before prize is redrawn. More about giveaways can be found here. I haven't but I'm very interested in trying their purple color! I have not tried this product but would like to try the MERLOT VIBRANT RED, oh ya!! No I have not tried the product. I would like to try the Light Cool Brown colour. I have not tried their products yet. I would love to try a mahogany brown colour. I have not tried these products before, but would love too. I'm always game for a hair colour change! Haven't tried it yet but would like to! i have not tried it yet, but will look for it next time! I have not tried any yet. I have never tried these dyes yet. I float between dark brown/auburn and blonde. I have not tried Vidal Sassoon hair dye before. I haven't tried this brand of at home dye but I usually use a deep brown or reddish brown when I dye my hair. It has been a long time since I coloured my hair at home. I would love to try a lighter blonde. Funny you should ask, I actually just bought some today at Walmart for the first time. I got a red colour. I love 5 Medium Neutral Brown! I have a coupon to finally try it for the first time. I haven't yet so I'm not too sure which is my favorite colour!